A week or so ago I shared with you a stunning rose gold brush set from DE'LANCI, which is a brand that I recently just came across. Not only do they sell brushes but also makeup products so I thought it was only fitting that I test out there 'Long Lasting Matte Lip Glosses. For those who are just as confused by their name as I was, these are not glosses, they are matte liquid lipsticks. 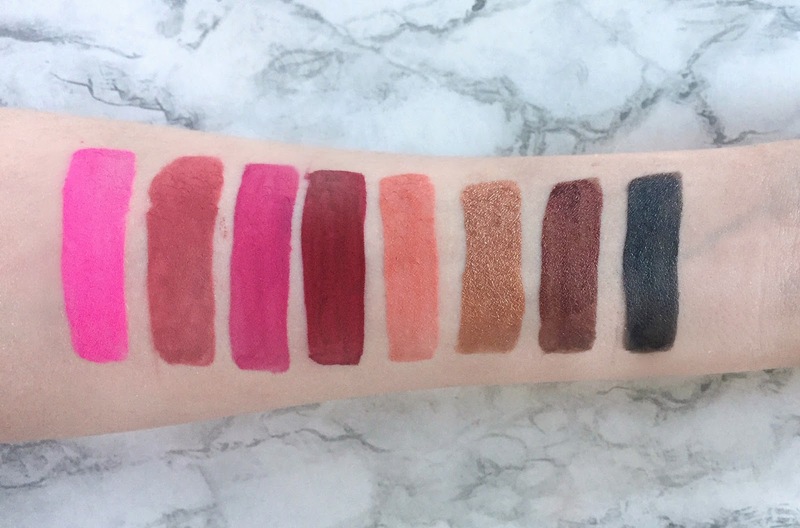 For under £15 you get 8 liquid lipsticks, 4 of which are regular mattes, and 4 are metallic mattes. That works out at just under £2 a lipstick! As with most liquid lips, they come in your standard clear tube with a gold cap. The wands are again a standard doe foot applicator that you find with most products like this. You get quite a quirky colour range in this set, especially with the more metallic shades. Moving from left to right, you get a neon pink, a dusty rose, a muted purple and a cranberry red and for metallics you get a peachy pink, a copper, a chocolate brown, and a black. At first swipe these are extremely pigmented, however some of the colours can be a little sheer so may take another layer to be totally opaque. I find this is the case more so with the metallic shades. Slowly applying in more of a delicate manner whilst adding more product gives a better result than just swiping them on quickly. The formula dries down pretty quick which is great and they feel very light on the lips as the formula is not at all on the thick side. For the price I really enjoy these liquid lippies. The best thing for me is that they really are true to colour, you could even use a few of these as Kylie 'dupes'. I say 'dupes' because the formula is very different but I can see similarities in a few of the colours.. That dusty rose is screaming out Candy K to me, not to mention her infamous metallic black. DE'LANCI Matte Liquid Lips are available on Amazon - HERE. They are so nice and such good value! Loving the black too! They are absolutely gorgeous! They look quite expensive and I was expecting a huge price, but you can't go wrong with that! Fab photos too. These look amazing. are they easy to apply?